WE DO GET IMPATIENT ,while we are waiting on God to answer our prayers ,to heal us among other things ,that we start to question God. O Lord , how long shall I cry, And You will not hear? Even cry out to You, “Violence!” And You will not save. Why do You show me iniquity, And cause me to see trouble? For plundering and violence are before me; There is strife, and contention arises. Therefore the law is powerless, And justice never goes forth. For the wicked surround the righteous; Therefore perverse judgment proceeds. “Look among the nations and watch— Be utterly astounded! For I will work a work in your days Which you would not believe, though it were told you. For indeed I am raising up the Chaldeans, A bitter and hasty nation Which marches through the breadth of the earth, To possess dwelling places that are not theirs. They are terrible and dreadful; Their judgment and their dignity proceed from themselves. Their horses also are swifter than leopards, And more fierce than evening wolves. Their chargers charge ahead; Their cavalry comes from afar; They fly as the eagle that hastens to eat. “They all come for violence; Their faces are set like the east wind. They gather captives like sand. They scoff at kings, And princes are scorned by them. They deride every stronghold, For they heap up earthen mounds and seize it. Then his mind changes, and he transgresses; He commits offense, Ascribing this power to his god.” Are You not from everlasting, O Lord my God, my Holy One? We shall not die. O Lord , You have appointed them for judgment; O Rock, You have marked them for correction. You are of purer eyes than to behold evil, And cannot look on wickedness. Why do You look on those who deal treacherously, And hold Your tongue when the wicked devours A person more righteous than he? (Habakkuk 1:2‭-‬13). “Have you not known? Have you not heard? The everlasting God, the Lord , The Creator of the ends of the earth, Neither faints nor is weary. His understanding is unsearchable. He gives power to the weak, And to those who have no might He increases strength. Even the youths shall faint and be weary, And the young men shall utterly fall, But those who wait on the Lord Shall renew their strength; They shall mount up with wings like eagles, They shall run and not be weary, They shall walk and not faint”. (Isaiah 40:28‭-‬31). Therefore , “I would have lost heart, unless I had believed That I would see the goodness of the Lord In the land of the living. 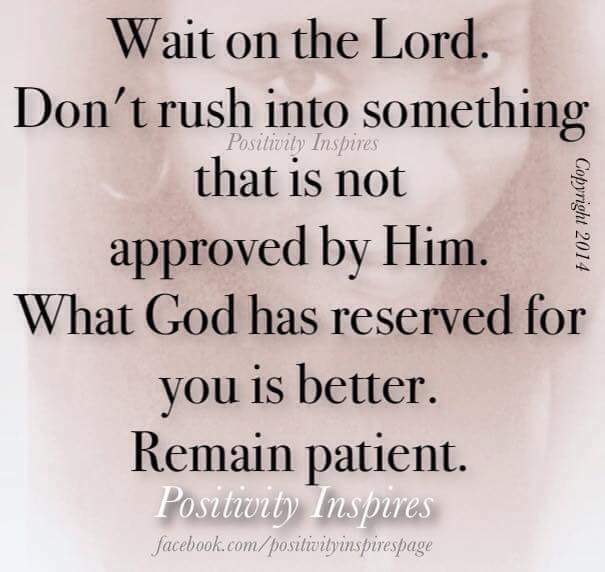 Wait on the Lord ; Be of good courage, And He shall strengthen your heart; Wait, I say, on the Lord ! (Psalms 27:13‭-‬14). Remember this,”Through the Lord ’s mercies we are not consumed, Because His compassions fail not. They are new every morning; Great is Your faithfulness. “The Lord is my portion,” says my soul, “Therefore I hope in Him!” The Lord is good to those who wait for Him, To the soul who seeks Him. It is good that one should hope and wait quietly For the salvation of the Lord” . [Lamentations 3:22‭-‬26]. The truth is that ,it is during the waiting process that we develop key attributes pertaining to life and Godliness . “My brethren, count it all joy when you fall into various trials, knowing that the testing of your faith produces patience. But let patience have its perfect work, that you may be perfect and complete, lacking nothing”. (James 1:2‭-‬4).